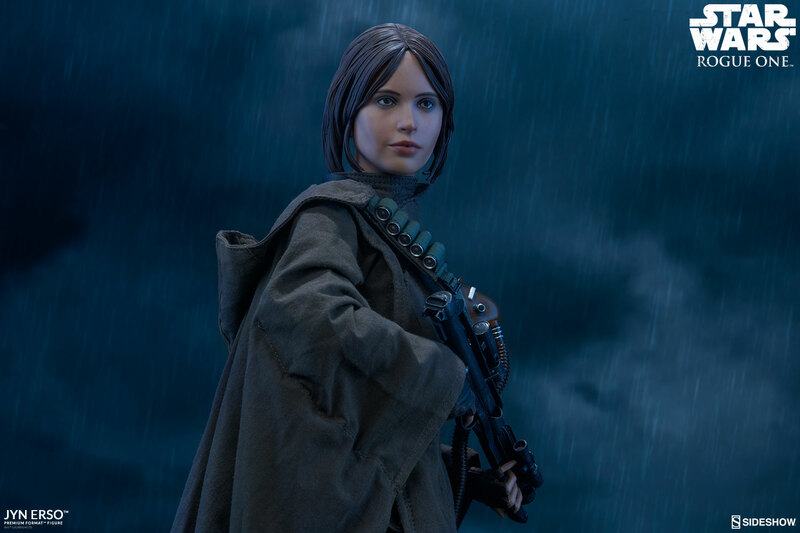 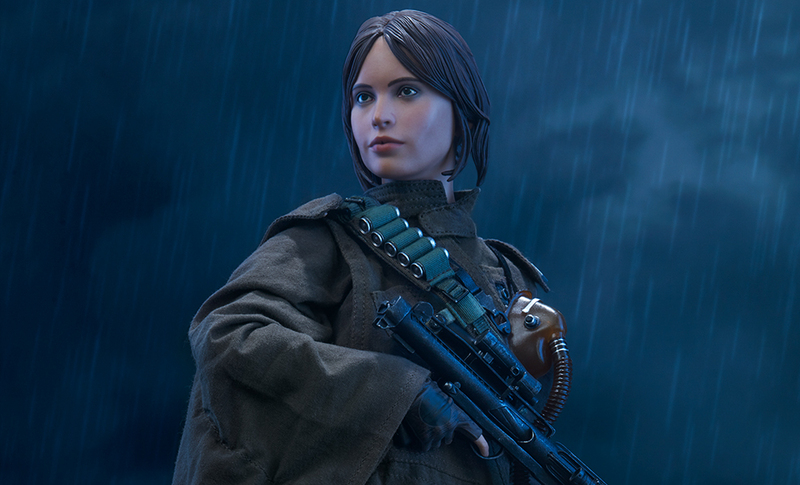 Sideshow’s Jyn Erso Premium Format™ Figure is ready for action in a hostile and unforgiving environment. 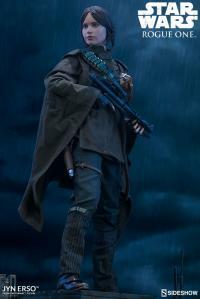 She is wearing a hooded weatherproof poncho with a portable breather mask hanging loosely around her neck and respirator pouch on her hip. 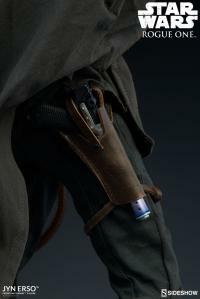 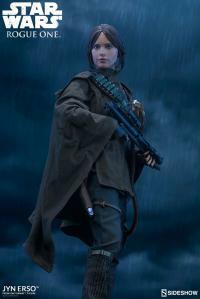 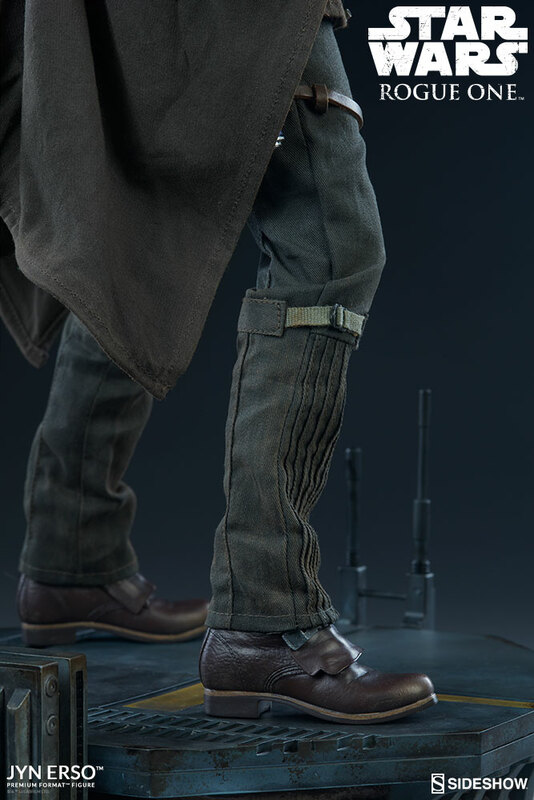 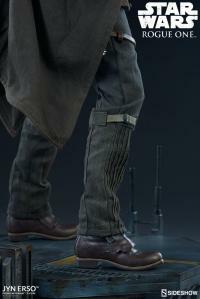 She is also carrying a Blaster Rifle and an additional BlasTech A-180 Blaster as a backup sidearm in a thigh holster. 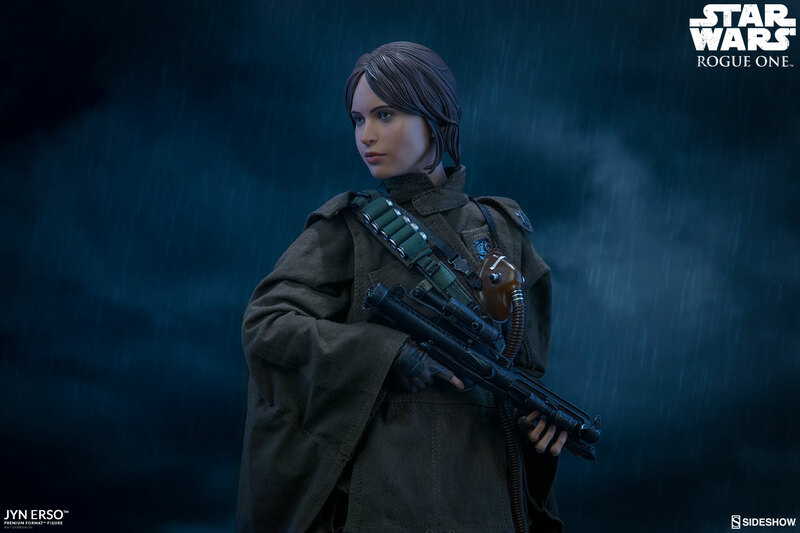 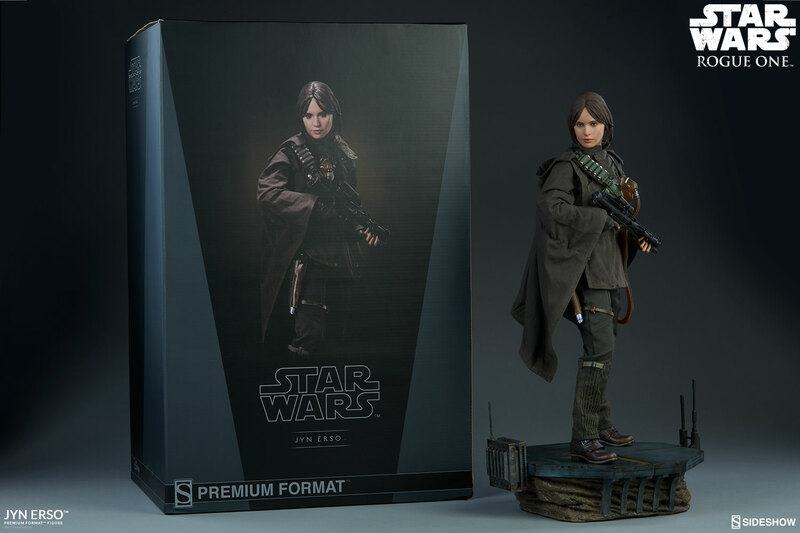 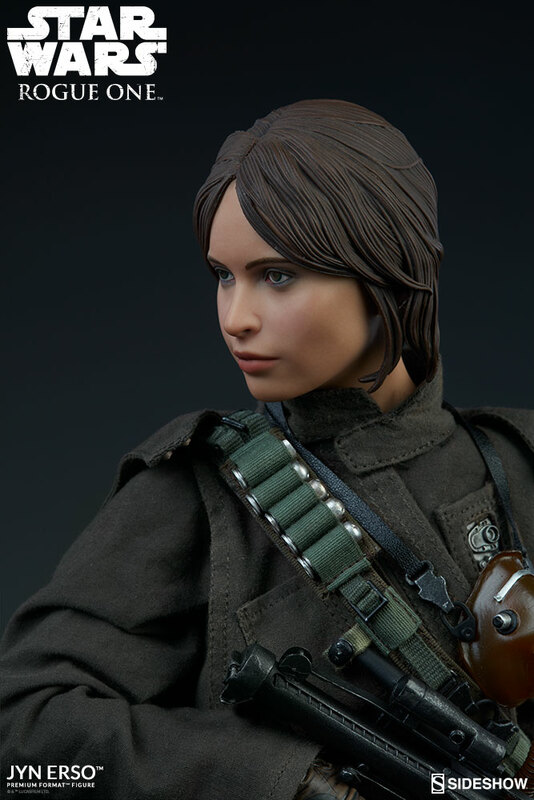 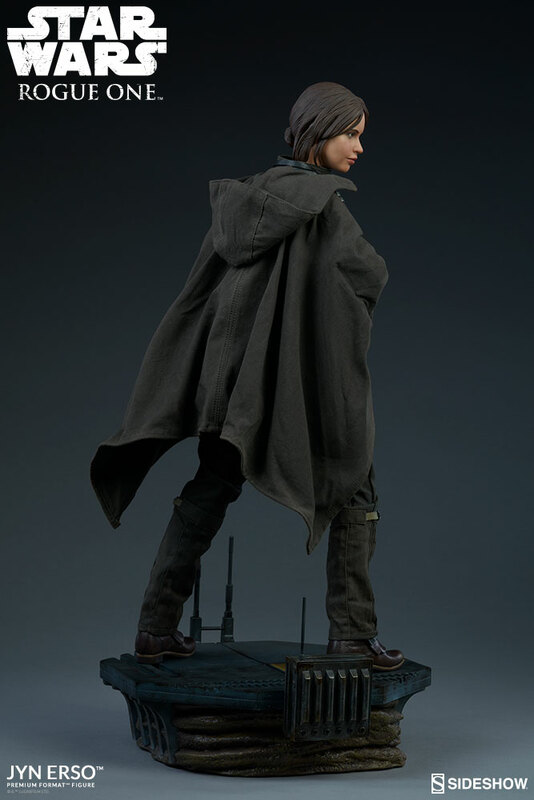 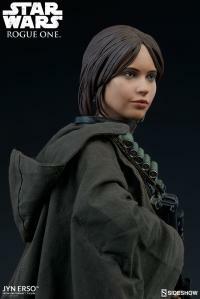 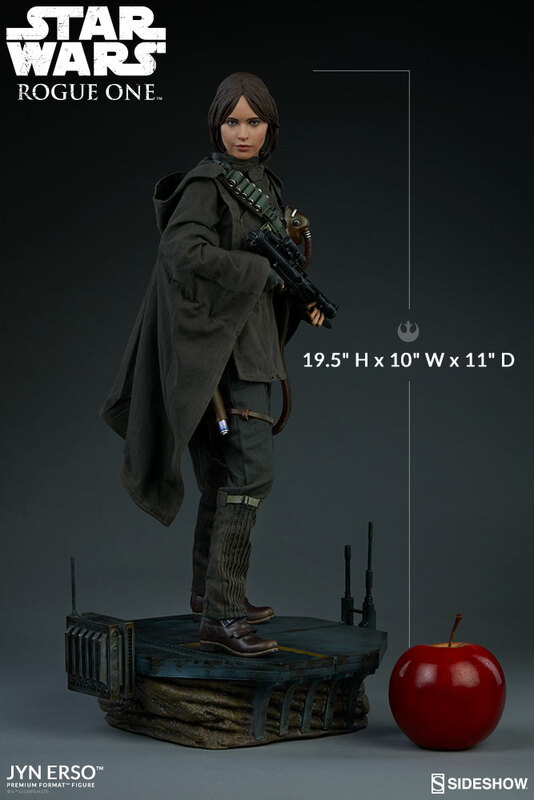 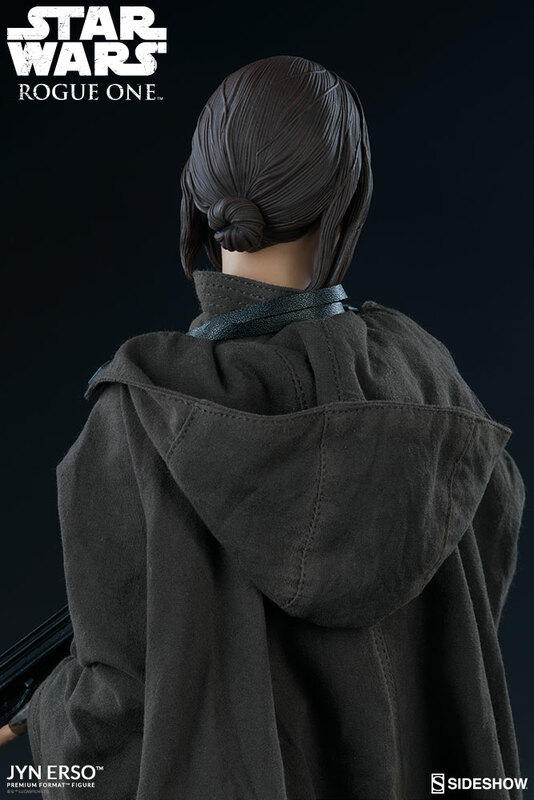 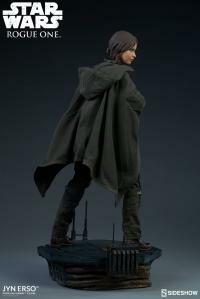 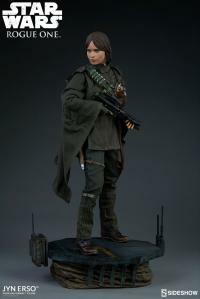 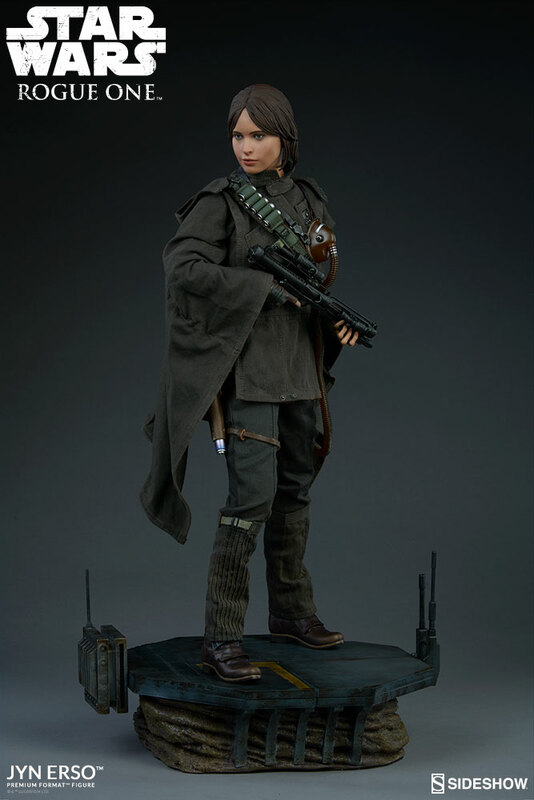 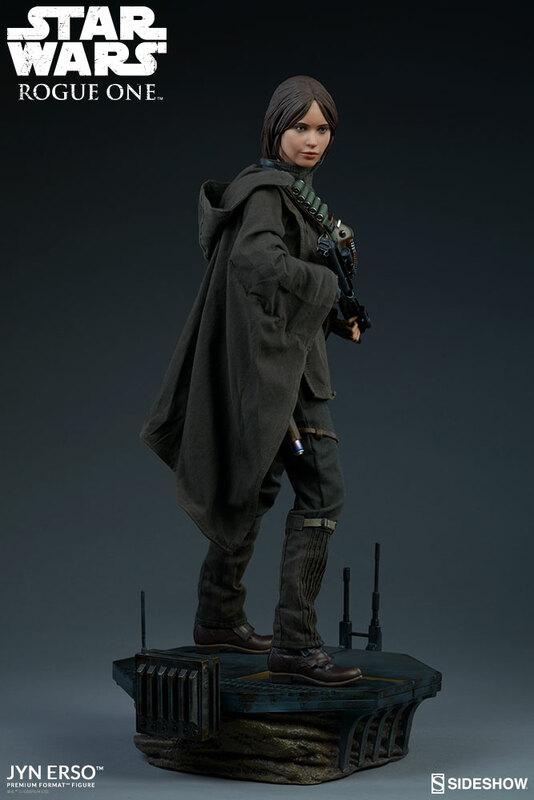 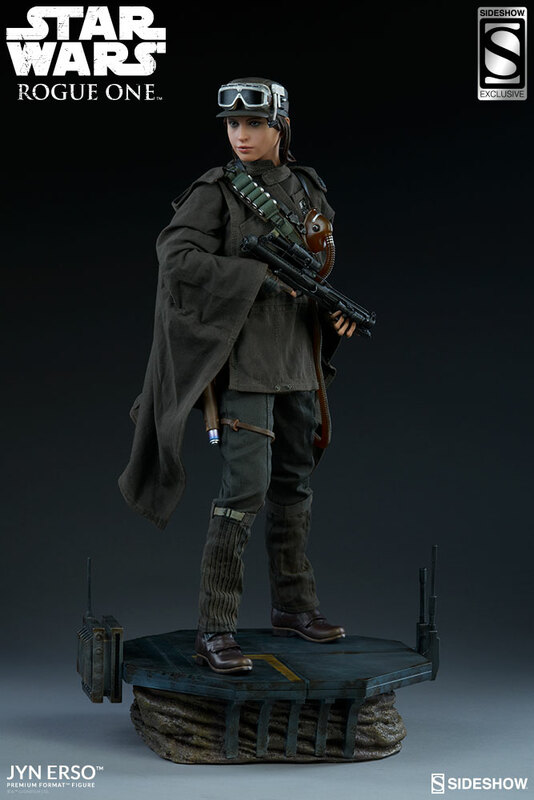 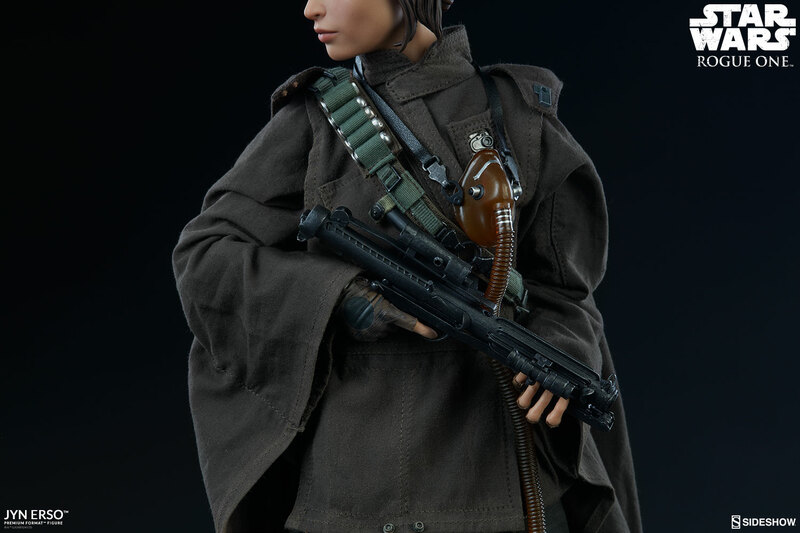 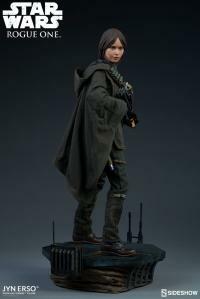 Our Jyn Erso Premium Format™ Figure features an incredibly realistic likeness of actress Felicity Jones that captures all of the charisma and personality that has already made her character so endearing. 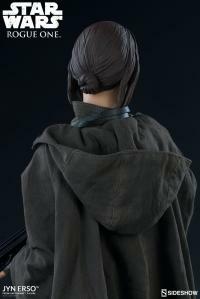 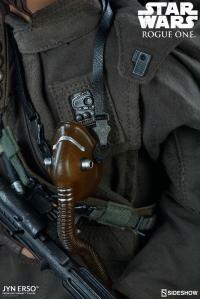 All of her movie-accurate clothing and equipment has been expertly duplicated with amazing attention to detail. 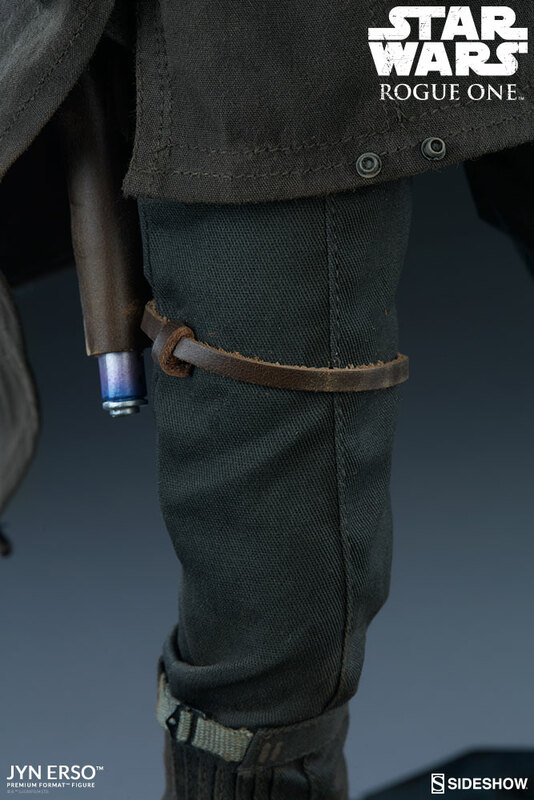 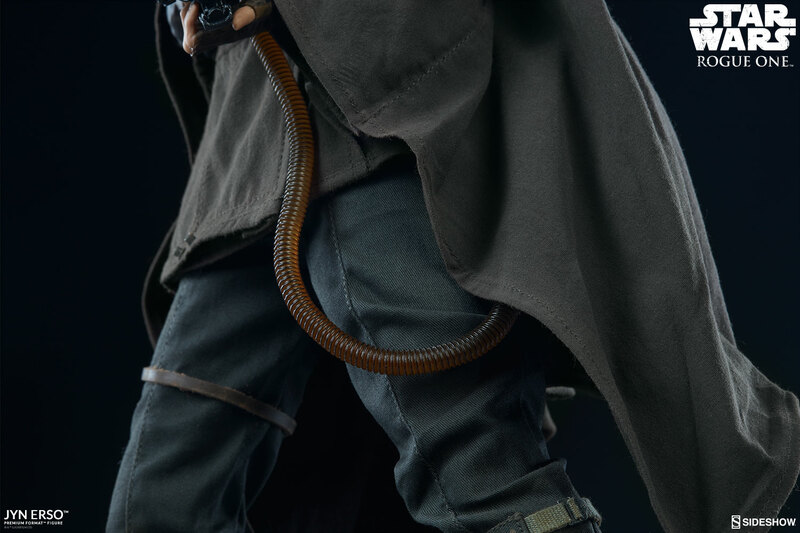 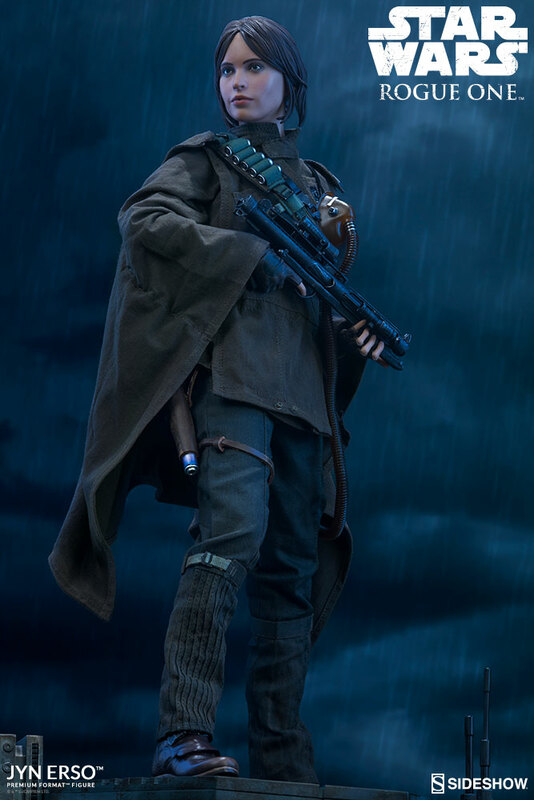 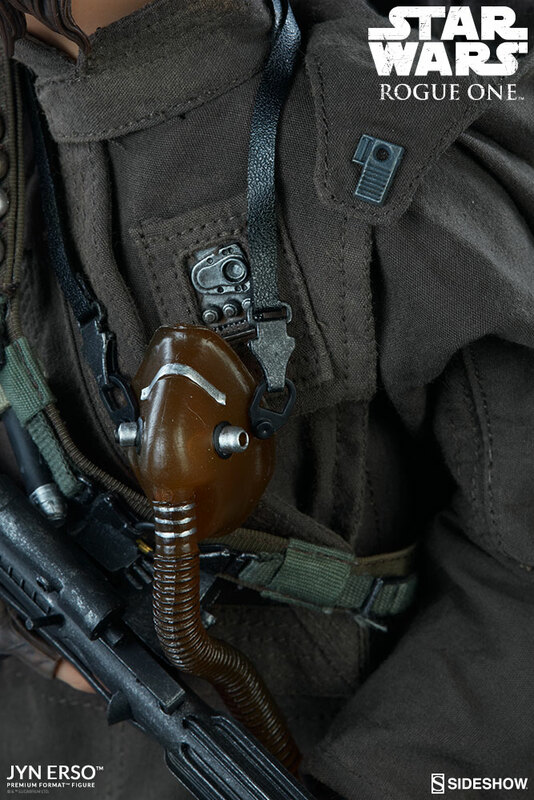 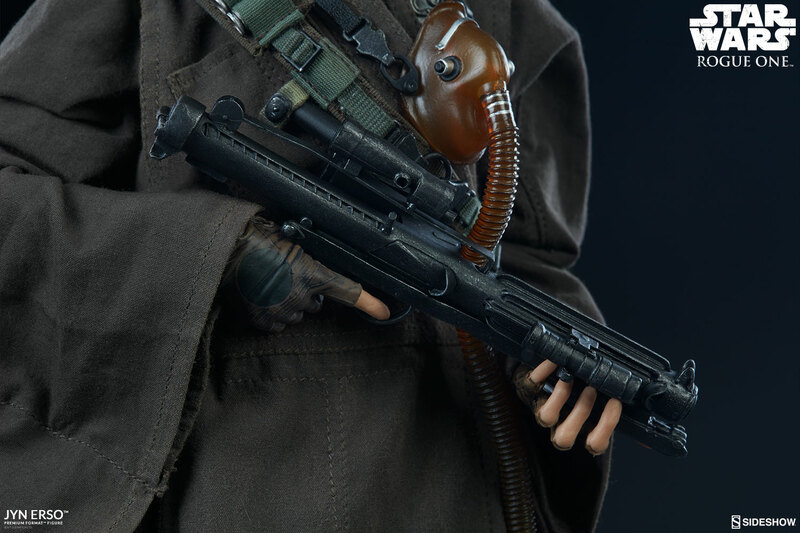 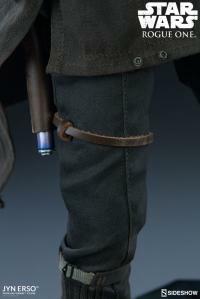 The scratched and scarred Blaster Rifle, the contrasting textures of her individually tailored garments, the rusted metal elements and filthy plastic of her respirator equipment, even the tiny buttons, clips and buckles on her gear have been individually sculpted to attain a level of detail that is just astounding! 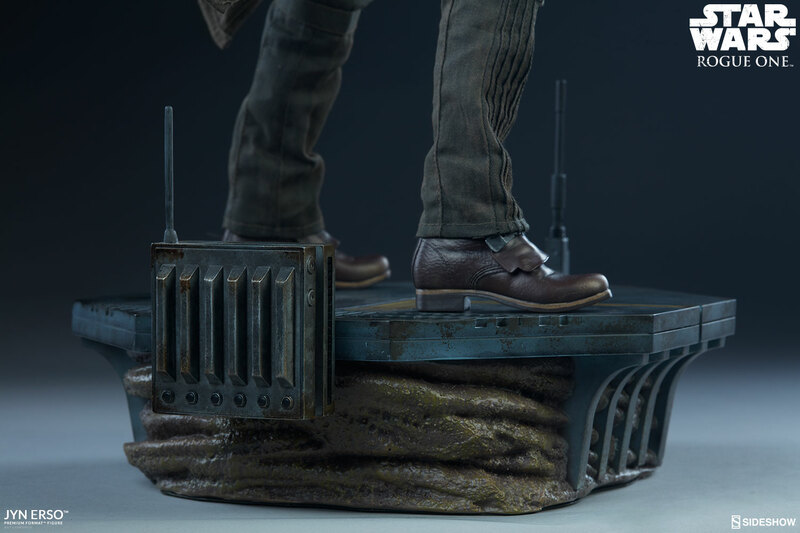 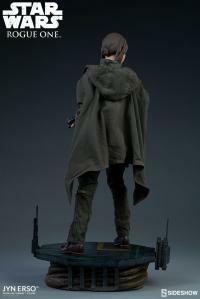 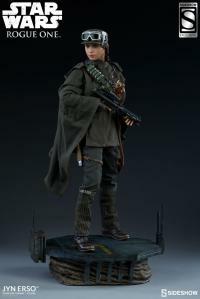 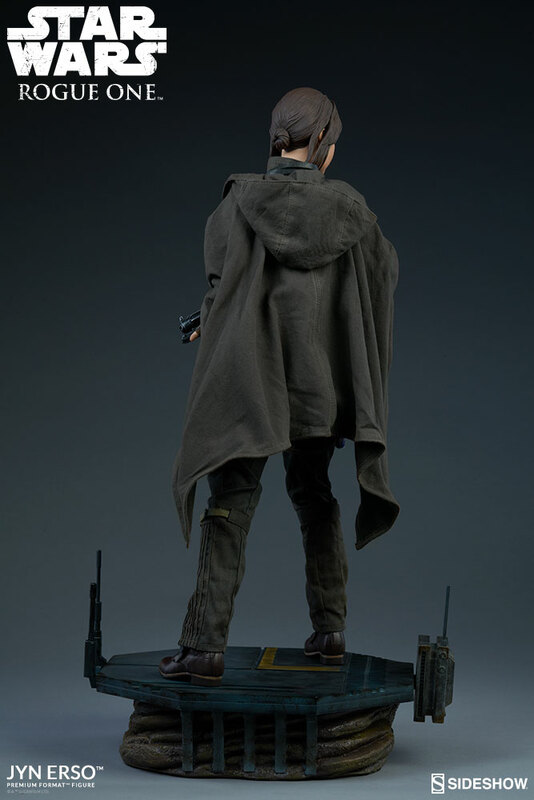 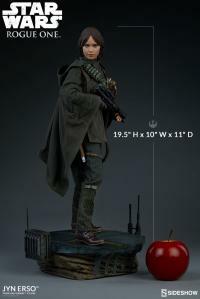 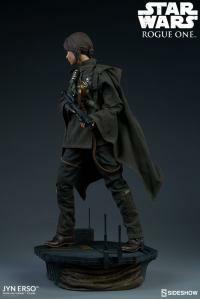 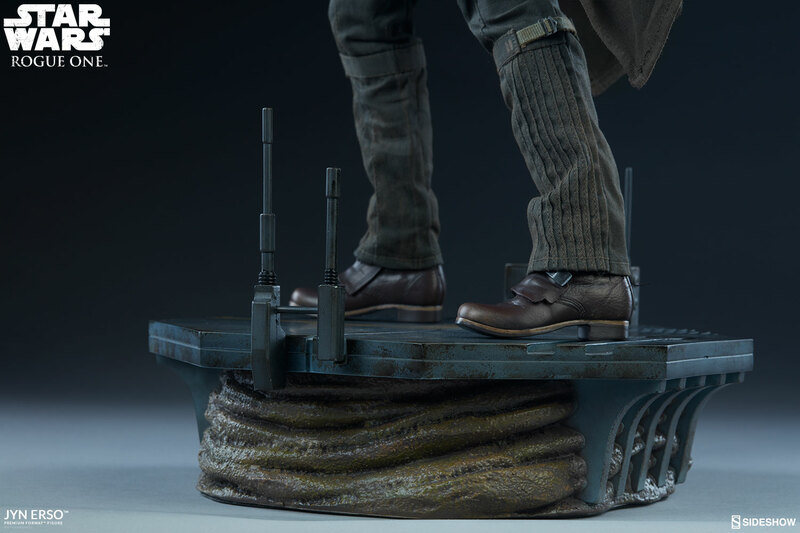 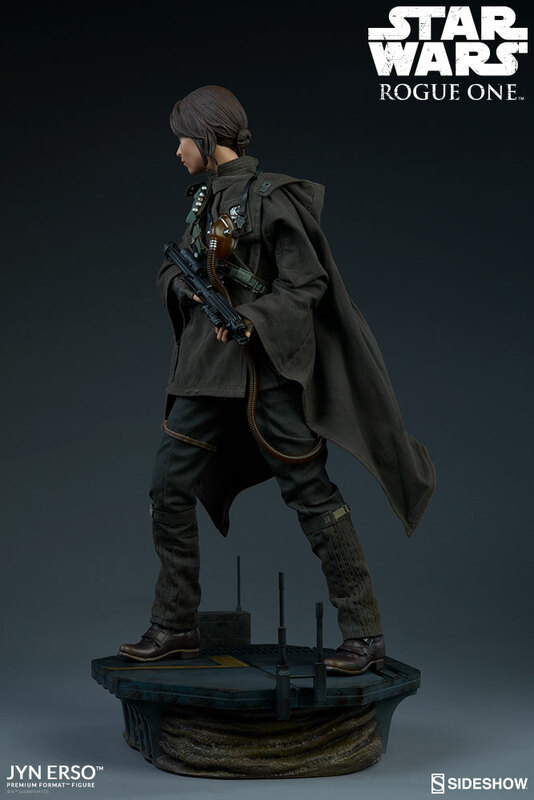 The statue features a beautifully sculpted and painted movie-inspired platform base, making this Premium Format™ Figure a proud focal point of your new Rogue One: A Star Wars Story collection! 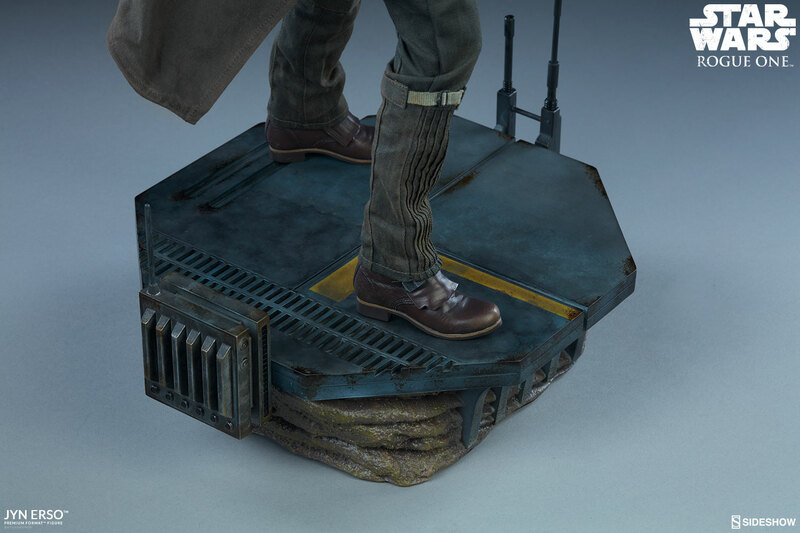 This Star Wars collectible statue features a beautifully sculpted and painted movie-inspired platform base, making this Premium Format™ Figure a proud focal point of your new Rogue One: A Star Wars Story collection! 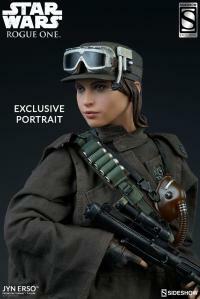 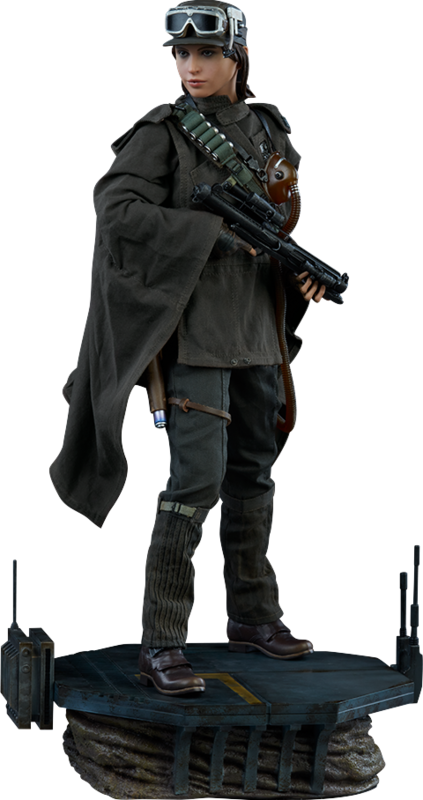 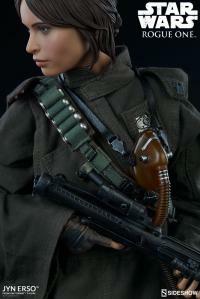 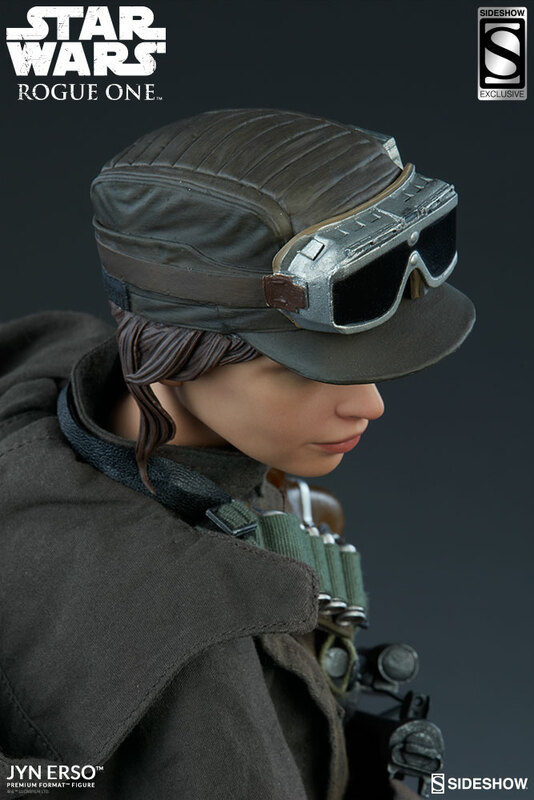 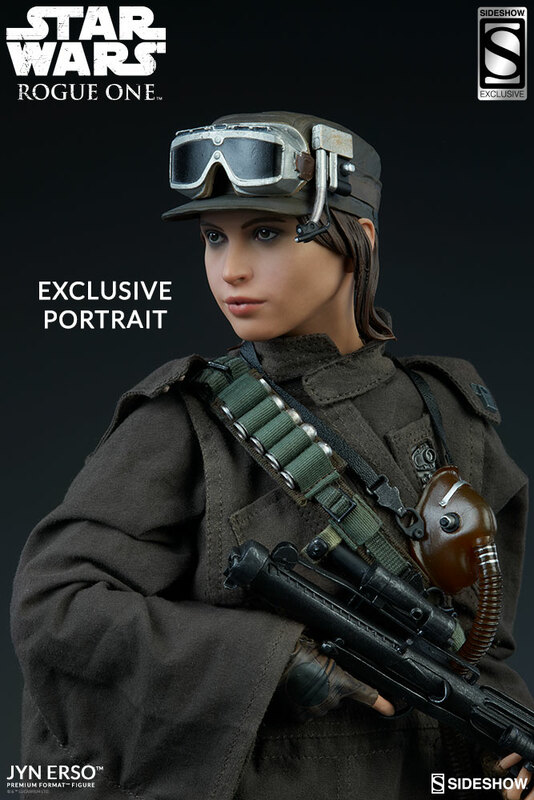 The exclusive edition of the Jyn Erso Premium Format™ Figure includes an entirely new head sculpt with highly detailed hat and goggles.